Whilst I'm usually not a huge fan of commercial ciders, it can be argued that they do have their place in the market. And for me, this is true when it comes to cooking with cider. This week's Cider Sunday therefore features Strongbow Apple Cider - One of the worlds most recognised and Australia's highest selling cider. It is widely available for purchase and has a great price point which makes it the perfect choice for this recipe. This recipe is sure to impress even the toughest cider critic. Combine all the rubbing mix ingredients, use half to make the brine and set the other half aside. Place the pork in a ceramic or stainless steel container and cover with the brine. Leave for an hour, then turn and refrigerate for 9 or more hours. Wash and pat dry. Next day, pre-set the oven at 150˚c. Rub the rest of the rubbing mix over the meat, place on a baking tray, and put it in the oven. Turn the oven down to 120˚c for 7 hours until the meat falls off the bone. Remove the tray from the oven, pour off and reserve any cooking juice. Let it cool before pulling the meat off the bone. Once the meat is shredded, add half a cup of the cooking liquid (if there is any). For the slaw; shred or julienne the apple and put lemon juice on it straight away to stop the apple from browning. Add the remainder of ingredients and salt and pepper to your taste. Warm the meat and serve inside slider rolls. Garnish with the apple slaw. Yum! 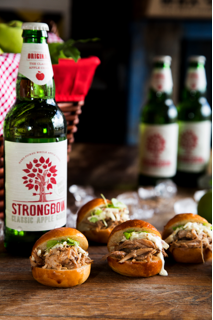 pork and cider = great combo! I'll try your recipe and serve it on lettuce leaves.